Travels to northern Arizona, including Sedona, Flagstaff and the Grand Canyon. 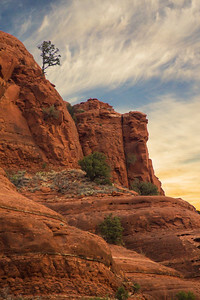 Up before dawn for a sunrise shoot at Bell Rock, an interesting rock formation south of Sedona, at Oak Creek Village. 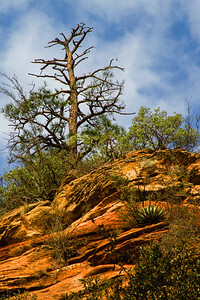 I liked this lone tree growing out of the rock at Bell Rock. Sedona, AZ. 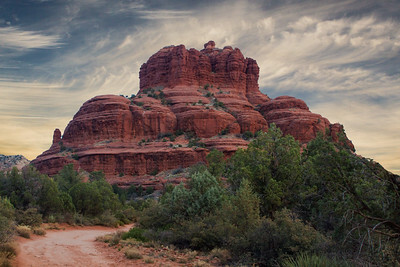 Sedona, AZ is surrounded by wonderful red rock formations. This is one I shot on an early morning shoot near Bell Rock. 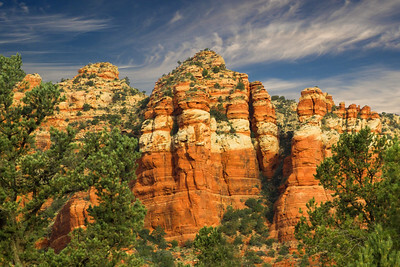 The town of Sedona, AZ is surrounded by wonderful red rock formations--everywhere you looks, there is something to see. 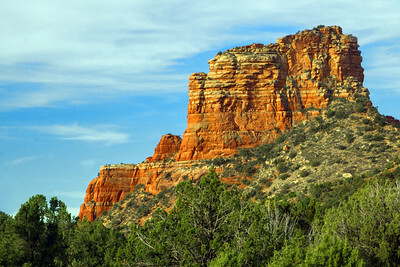 This is a view of the cliffs near Sedona, AZ. 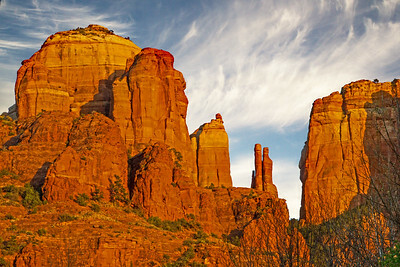 The sunset light on Cathedral Rock gave a bright glow to the rock formations. Sedona, AZ. There were no clouds for the sunset, but the golden light created a wonderful glowing color in the rocks and reflections. 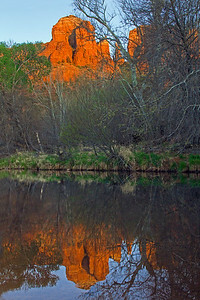 A close up view of Cathedral Rock as sunset nears. The red rock glows with the golden light. 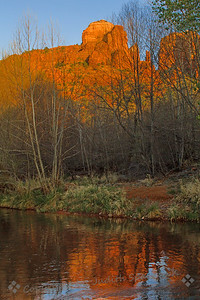 Oak Creek reflections of Cathedral Rock, Sedona, AZ. 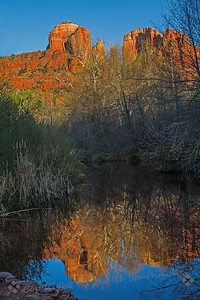 Beautiful light cast on Cathedral Rock is reflected in the creek, Sedona, AZ. 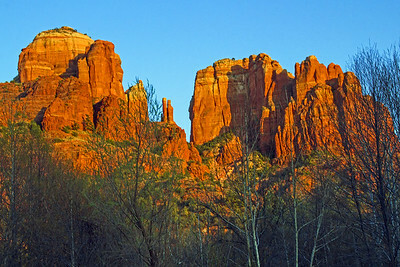 As the sun went low in the sky, the colors of the red rock formations lit up and glowed. 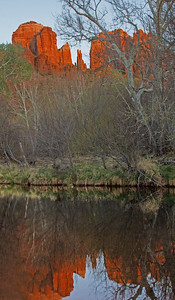 Here Cathedral Rock is reflected in Oak Creek. Sedona, Arizona. 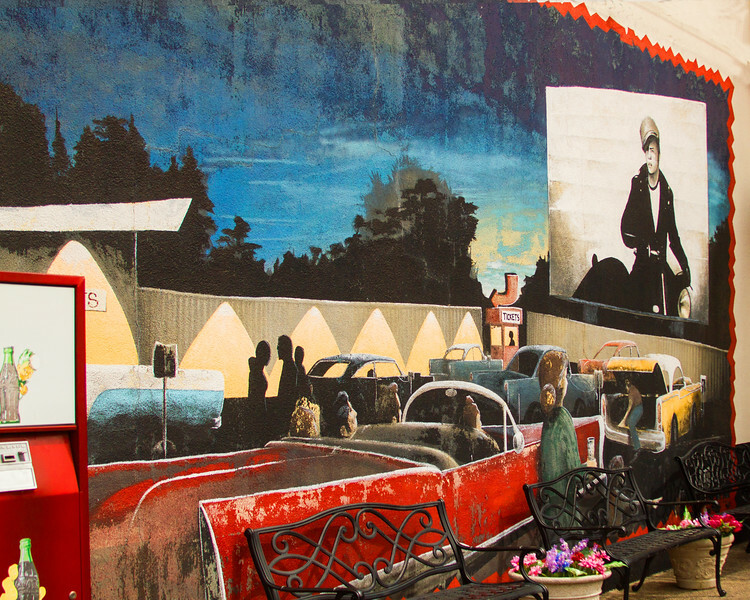 Around Sedona there are several places that have been called a vortex, a place of the convergence of energies. In some of these places people have placed many stacks of stones, or cairns, to mark the spots. 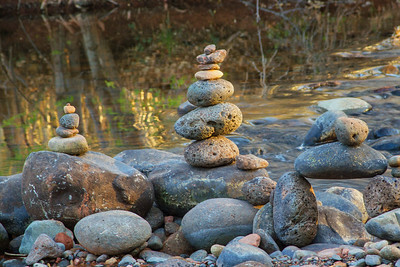 This shows just a few of perhaps 20 or 30 cairns placed next to Oak Creek. 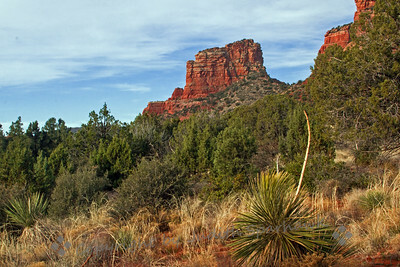 A view upslope from Cave Springs Campground, Oak Creek Canyon, Sedona, AZ. 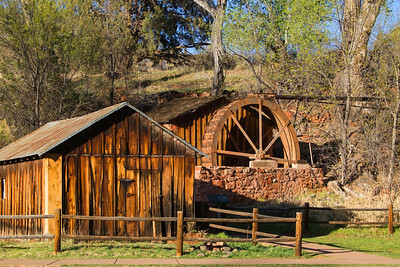 This historic old mill was on the grounds of the State Park from which we photographed the reflected Cathedral Rock. 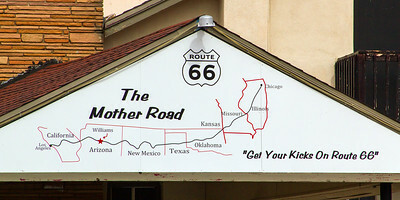 A brief stop in the historic Route 66 section of Williams, AZ . 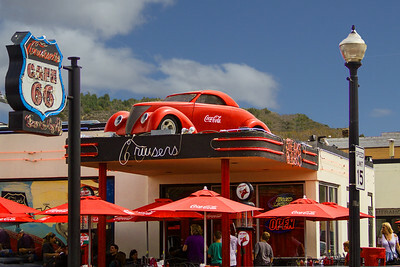 A fun-looking eatery along Route 66 in Williams, AZ. 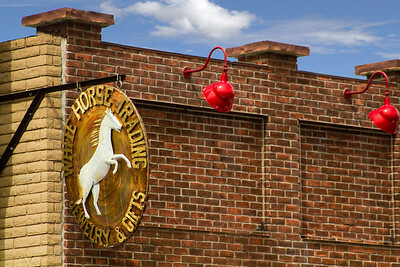 I liked this sign and the red lights on the old brick building in Williams, AZ. 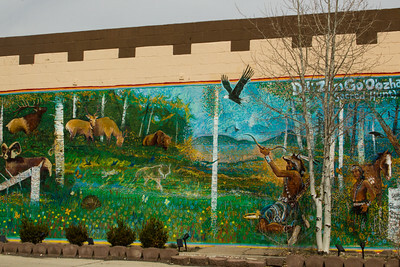 One of several murals found in Williams, AZ. 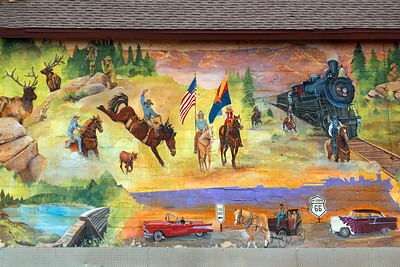 Another mural found on an outside wall in Williams, AZ. 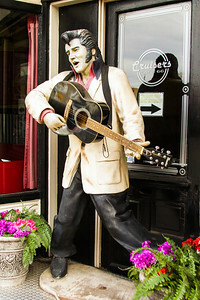 This somewhat weather-worn Elvis was found next to the Cruisers Cafe 66 in Williams, AZ. 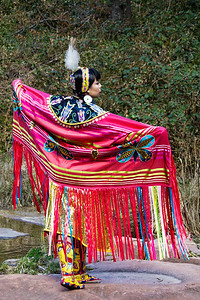 Navajo dancer Yolanda Tsosie is dressed for the Fancy Shawl Dance, and displays the colors and designs of her shawl. 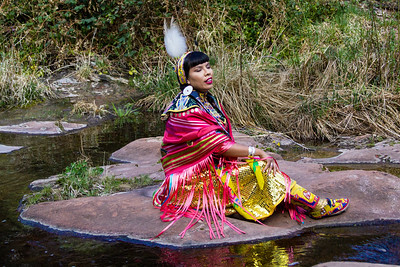 Yolanda sitting by the water, her colorful clothing reflected in the stream. Yolanda Tsosie.